Jidoosha Fudo 自動車不動 "Fudo in a car"
. Yakushi Nyorai 薬師如来 Buddha of Medicine . Takada is a small mountain village in the South-Western part of the Aizu plain along the river Miyagawa 宮川 . 80 percent of its space is mountain forest. One of the famous shrines of the former Mutsu province 陸奥国二宮 and Iwashiro province 岩代･越後国境 is also located here. The temple started out humbly as a sanctuary called 千寿院 Senju-In in the year 779. Later in 848 Priest Jigaku Daishi 慈覚大師 Ennin built the first temple. In 1190 円鑁沙門 rebuilt the temple and added the Yakushi Hall 薬師堂, giving name of "Yakushi Temple" 薬師寺 to the complex. 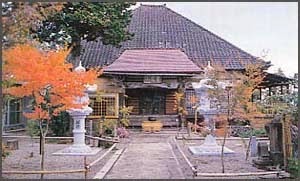 The temple has sessions of Zazen meditation of the Tendai sect of Buddhism. There are also lessons for "Makashikan" . 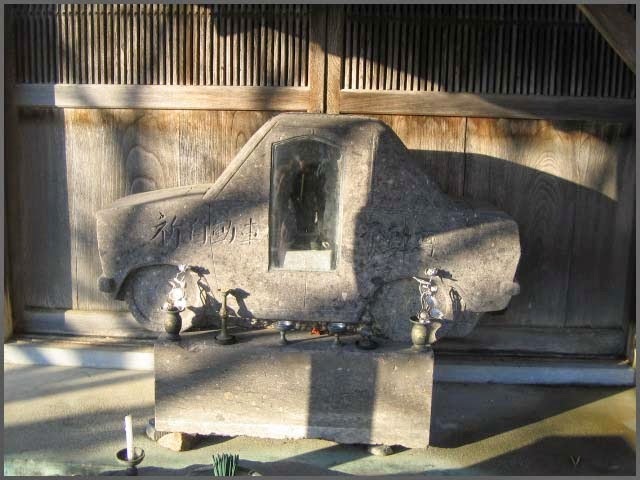 jidoosha fudoo son, jidōsha Fudōson 車不動尊 stone statue of "Fudo in a car"
to pray for the safety on the road (kootsuu anzen　交通安全) is the latest addition of our modern times.
. 交通安全 お守り Traffic Safety Amulets . 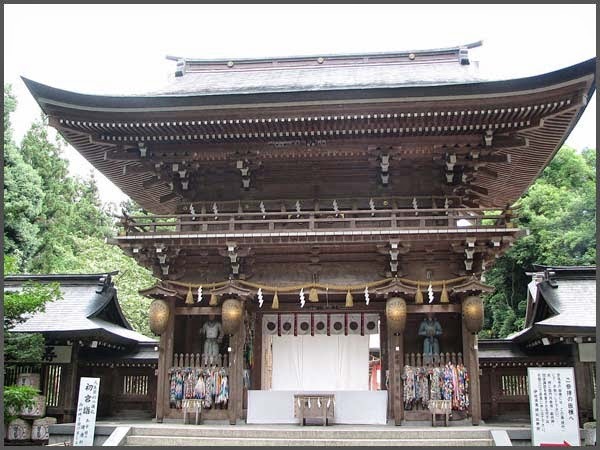 Isasumi was designated as the chief Shinto shrine (ichinomiya) for the former Iwashiro province. 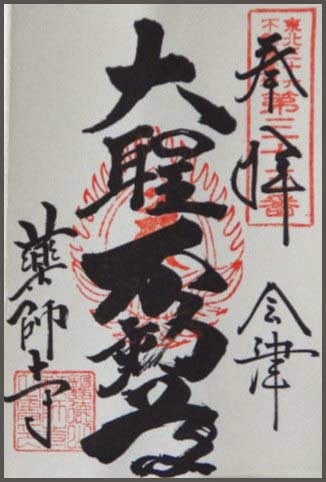 From 1871 through 1946, Isasumi was officially designated one of the Kokuhei Chūsha (国幣中社, meaning that it stood in the mid-range of ranked, nationally significant shrines. 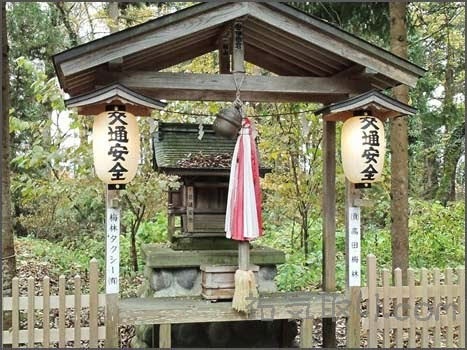 Though not backed by accurate historical records, some believe the place name Aizumisato derives from this shrine. 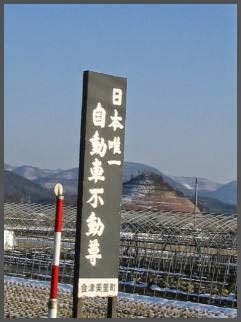 The shrine is also the locale for the annual taue-shinji, or rice planting, Shinto ritual. This ritual has been performed in this shrine for centuries, and the Fukushima Prefecture has designated the shrine an Important Intangible Folk Cultural Property. Currently, the festival of the rice planting is known as the Otaue Festival. The festival falls on July 11 or 12 annually. The rice planting ceremony, held during the daytime, is considered as important and reverential as the Asataue, or morning planting, ceremony of the Ise Grand Shrine and the Yutaue (evening planting) held at the Atsuta Shrine. The rice planting ceremony at the Isasumi Shrine is widely regarded as one of the highlights of the Shinto rituals. Isasumi Shrine in Aizumisato-machi, which lies in the south west of the Aizu basin, is a myojin taisha or a high-ranking shrine that was listed in the Engishiki and is the second most revered of all shrines in the Tohoku District. There is also a legend that the areas name "Aizu" originated from this shrine. The taue-shinji or the rice-planting Shinto ritual, which has been inherited by this ancient shrine, is an Important Intangible Folk Cultural Property designated by Fukushima Prefecture, and is performed as the Otaue Festival presently. 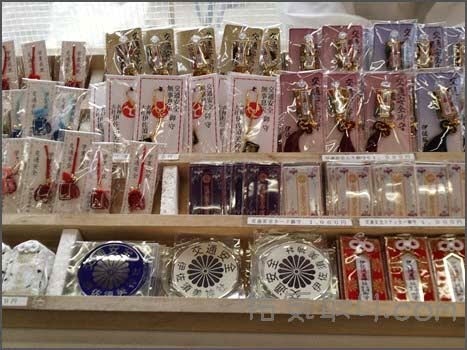 The festival is held on July 11-12 annually and is revered as Hirutaue (day planting) of Takada, and considered on a par with Asataue (morning planting) of Ise Shrine and Yutaue (evening planting) of Atsuta Shrine. It is a valuable Shinto ritual that conveys the traditional rice planting culture of Aizu through ancient rituals such as Saibara, Shishioi, and Taue Ningyo.
. WKD : taue, ta-ue 田植 planting rice in the paddies . There is also a Tenmangu in the precincts, to pray for passing examinations. A rite held on the fifth day of the fifth lunar month at Isasumi Shrine in Aizutakada Township, Ōnuma District, Fukushima Prefecture. Two mounds of sand are constructed on the shrine grounds (keidai) to serve as the ritual space. The shiogamakami (kami of the urn for making salt from saltwater) who is enshrined in the aidono (a structure enshrining multiple kami) is transferred (kanjō) to the mounds of sand. Two priests wearing torikabuto (hats specifically worn by gagaku dancers) and ōnohana masks (masks with long noses) intone a secret chant while pounding three eight-sided stakes into the sand mounds with a hammer. They present offerings and chant liturgies (norito), there is a dance by shrine maidens (miko), and all participants worship together. Rice cakes wrapped in bamboo leaves are presented as offerings (shinsen). The region is extremely mountainous and it was extremely difficult to obtain salt here in the past. The rite is held to ensure the availability of salt. This festival is also called the endo matsuri.
. Shiogama Myoojin （塩釜明神, 鹽竈明神) Salt Deity . held July 13　—　the day after the rice-planting festival (taue matsuri). Also known as the maguwa'arai matsuri ("wash the harrow festival"　まぐわあらい), all work stops for a day — a practice referred to as kuwakamadome ("putting down the hoe and scythe") — in villages throughout the Aizu region in order to celebrate. The otaue matsuri held on July 12 at Isasumi Jinja in Aizutakada Town, Ōnuma County, Fukushima Prefecture, is known as one of the three taue of Japan along with Ise Jingū's asataue (Morning Rice Planting) and Atsuta Jingū's yūtaue (Evening Rice Planting). At approximately ten o'clock in the morning, a shinkōsai begins with the first taiko. After a ritual shishioi (Lion Chasing) by the children, the second taiko signals the shinkō progression to the massha (branch shrine) Mita Jinja and an otaue matsuri takes place. The shishioi is composed of the following eight types of shishi masks: adult shishi, white shishi, dappled grey ponies, deer, lead oxen and following oxen, white horses, and red horses, along with a few hundred boys wearing headbands dressed in under-kimono with tasuki (cords for tying up sleeves). After this group, the sacred palanquin (shin'yo) procession (togyo), with several hundred attendants wearing kamishimo (the formal dress of the samurai), sings a saibara (a kind of kagura performance) until arriving at Mita Jinja. After they have arrived at the shrine, a taue matsuri occurs in front of the shin'yo. This is an immense round trip journey between the main shrine and Mita Jinja. It is also the custom to pass through the private houses along the road as the procession goes back and forth between the two shrines. Kukai Kobo Daishi, priest Tokuitsu and the fighting with the Emishi people in the Tohoku region by the imperial government in Kyoto.
. Enichiji 慧日寺 Enichi-Ji .